The Apple Macintosh 12-inch RGB Display was introduced with the Mac LC in October 1989. It uses a 13-inch Sony Trinitron CRT, which is curved horizontally but flat vertically. The monitor can sit on top of most desktop Macs. Apple recommended against using this monitor at maximum brightness and suggested using a screen saver to avoid phosphor burn caused by static elements on the screen, such as the Menu bar, Drive icon, and Trash. This monitor is compatible with a limited number of Macs and video cards (see below). The case was used for both the 12-inch RGB display and the 12-inch monochrome display. Picture tube: 12-inch viewable diagonal screen. 90° deflection angle. Black matrix-type dot screen. Phosphor type P22 (aluminized). Spherical, antiglare surface. Screen resolution: 512 x 384 fixed lines; 64 dpi. Displays up to 256 colors with Macintosh Display Card 4*8 and 16.7 million colors with Macintosh Display Card 8*24. Scan rates: Vertical refresh rate: 60.15 Hz. Horizontal scan rate: 24.48 kHz. Rise and fall time: 27 ns maximum. Active video: 8.08 inches by 6.02 inches. Input signals: Video: red, green, and blue analog video; RS-343 standard. Dimensions: 10.2-inch (height) x 12.2-inch (width) x 14.4-inch (depth). Weight: 24 lbs. (35 lbs. including cables and accessories). User controls: Rear panel: power switch. Right side: brightness and contrast controls. Compatibility: Macintosh LC. Macintosh LC II. Macintosh IIci. Macintosh IIsi. Macintosh Display Card 4-8. Macintosh Display Card 8-24. Position the display and computer so that you can easily access the back panel of each. Connect the end of the display’s video cable to the appropriate video socket on the computer. If your computer has a built-in video port, plug the cable into the video port, which is the horizontal socket on the computer’s back panel that’s marked with the video icon. If you have installed a video card, plug the cable into the vertical connector on the video card. Tighten the thumbscrews. Tightening the two thumbscrews keeps the connection from coming loose, and helps prevent radio and television interference. Plug the display’s power cord into a grounded AC outlet. If you have other peripheral devices you want to connect to your computer, do it now while you have easy access to the computer’s back panel. If not, you’re ready to start the computer and the display. To turn your display on, press the on/off switch on the display’s back panel. When you turn on the display, you should see the green power light come on. If the power light doesn’t come on, press the on/off switch again. If this doesn’t work, make sure you’ve connected the display according to the instructions in the previous section. If the light still doesn’t come on after you’ve checked the connections, consult the troubleshooting section later in this guide. To turn the display off, press the on/off switch again. Once you have a program running, you can adjust your display. The brightness and contrast controls are on the side of the display. An icon identifies each control. Turn the contrast control toward the back of the display until it stops. Turning the control toward the back of the display increases contrast; turning it toward the front decreases contrast. Adjust the brightness control until the screen brightness is comfortable. As you turn the brightness control, you’ll feel a catch near the center of the brightness range. This position — called detente — usually marks the best balance between light and dark on your display. Turn the contrast control slowly toward the front of the display to decrease the contrast (and soften the image) until it reaches a comfortable level. By the way, if you use your display at a high brightness setting for extended periods of time, you may decrease its life expectancy. You’ll get the longest life from your display by setting the brightness control at the detente position and the contrast at maximum. The Macintosh 12-inch RGB Display is designed for use with any Macintosh computer that has a built-in video port, or any Macintosh with the appropriate video card installed. Because of the Trinitron display, there is a thin horizontal wire about one-third of the way up from the bottom, which users may see as a thin gray line. This is normal, and not a defect. This display uses Apple’s DB-15 video connector, not to be confused with the smaller, higher density DE-15 VGA video connector. To clean the screen, Apple suggests applying household glass cleaner to a clean cloth or paper towel and wiping the screen. 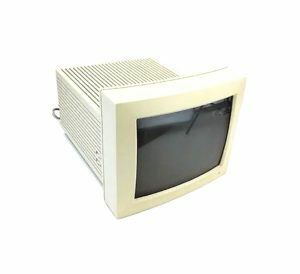 Avoid spraying glass cleaner directly on the CRT, as it could run down the screen, into the case, and damage the internal electrical circuitry. The Macintosh 12″h RGB Display only needs 20 minutes of warm-up for complete warmup, but can be used immediately..
Can’t help but sell here. Take a close look at the prices we offer: Used Apple display for sale. Hi I have one of these old computers. My husband liked to use it basically as a word possessor, since its not hooked up to the internet. A friend came over to fix something on it, years ago and somehow the Claris Works program is gone so now nothing works. I am wondering how to reinstall Claris works?? I don’t have the floppy and have no idea where to look for one. Can you help me? Hi, Shelley. This is a good one. Let’s ask an old friend of us, she may be able to help. Please wait a day or so.